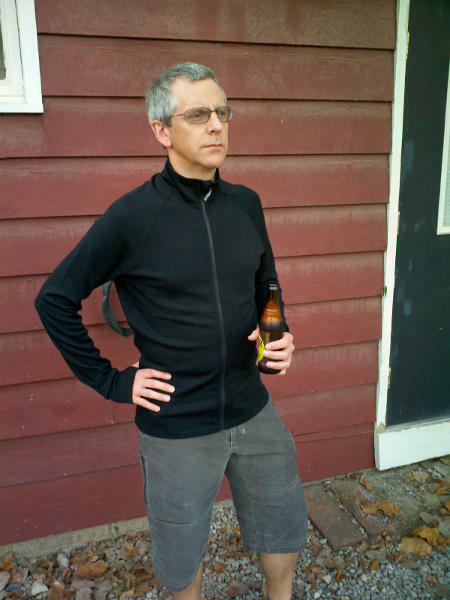 Spook-tacular Savings on Bike Tune-Ups and Everything Else! Whether the nasty fall weather has you spooked to stay inside, or you continue to ride no matter what, now is the perfect time to bring your bike in for its annual tune-up! Print the coupon below for spook-tacular savings on all of Century Cycles' Tune-Up Service Packages. Plus, see the other coupon for more spook-tacular savings on everything else in our stores! The ale was officially hailed! Thanks so much to the 140+ beer-clad bicyclists who rode with us on Saturday, October 20, for our final Night Ride of 2012 in celebration of Cleveland Beer Week. A hearty "cheers!" 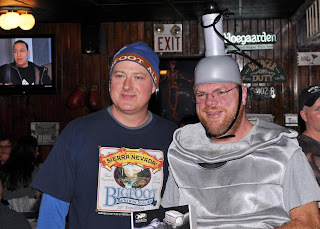 and congratulations goes out to the winner of our Best Beer Costume contest, Bill "Beer Keg" Wolohan, pictured above receiving his Century Cycles prize from Rob Gerrity of Sierra Nevada Brewing. Lots of other folks dressed in wonderful costumes -- check them all out in the slideshow below and see if you can spot the Wright Pils, the Chimay Trappist, the Burning River, the Angry Orchard, the Home Brewer and many more! 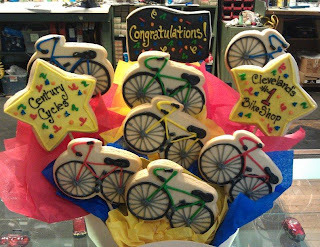 We also gave away a huge box of prizes provided by Century Cycles and our excellent fellow sponsors, Sierra Nevada Brewing, Winking Lizard and MDS Foods. Our 19th season of Night Rides will commence in April, 2013 -- if you had fun this past season, we hope you can join us NEXT season! Click here if the slideshow above is not appearing for you. 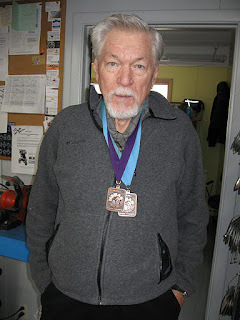 All photos by Doug Charnock and Mike Petcher. 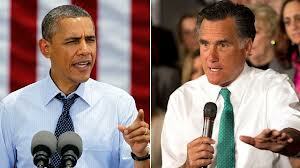 The last of this season's Presidential Debates is tonight. 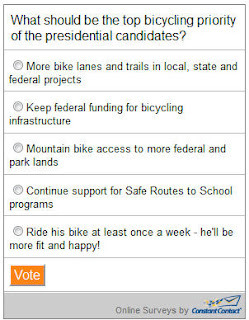 The focus tonight will be on foreign policy, but where do you think the candidates should stand when it comes to bicycling? 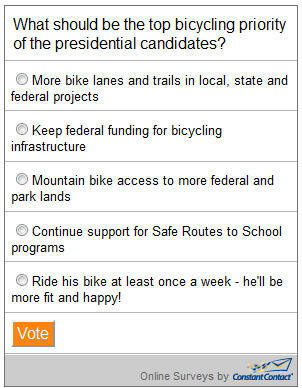 Take our latest online poll to let us know! Our last online poll asked, "Bicycles built for two: What's your verdict on tandems?" The largest number of respondents (42%) either have a tandem already, or want to get one. However, the next largest (24%) said "Heck no - solo is the way to go." You can see the full results of the last poll here. Brecksville, Ohio – The National Park Service announces the closure of the Ohio & Erie Canal Towpath Trail from the Frazee House Trailhead to Station Road Trailhead, from 7:00 a.m. to 5:00 p.m. weekdays, Monday, October 22 through Friday, November 9. 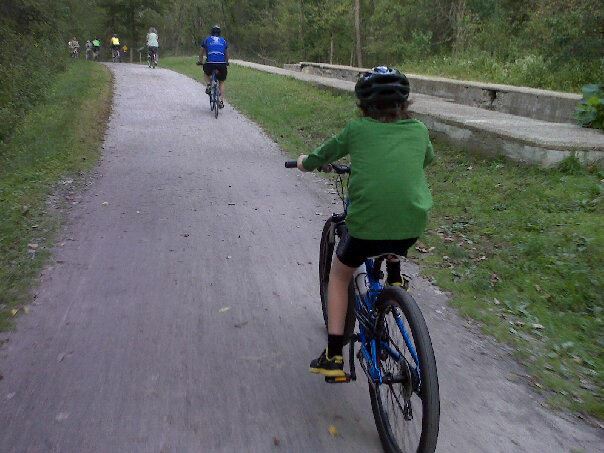 The Towpath Trail will be open evenings and weekends. The closure is necessary to repair the failing Sagamore Waste Weir and clear brush along the Ohio & Erie Canal. Frazee House Trailhead is located at 7733 Canal Road, Valley View 44125. 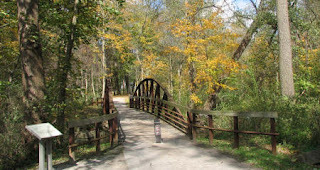 Station Road Trailhead is located at 13513 Station Road, Brecksville 44141. CVNP encompasses 33,000 acres along the Cuyahoga River between Cleveland and Akron, Ohio. Managed by the National Park Service, CVNP combines cultural, historical, recreational, and natural activities in one setting. For more information, visit www.nps.gov/cuva or call 330-657-2752. 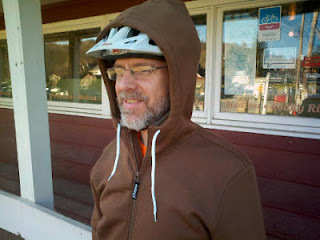 Q. I am a very overweight person, and I'm thinking about getting into cycling to improve my health. Is there a bicycle for me? This is a question that we receive on a regular basis. We commend these individuals for their commitmet to get in shape, and we assure them that yes, EVERYONE can enjoy the benefits of cycling. 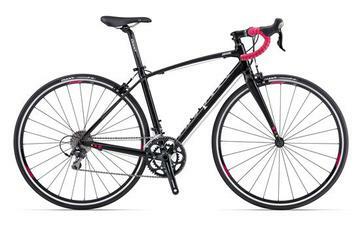 In choosing a bicycle, you'll have many of the same considerations that any person would have. You'll want to choose the right style of bike for you, based on your comfort level, and where you'll be riding the bike. 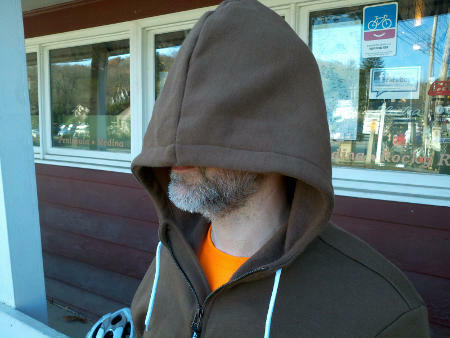 There are a couple of extra considerations that heavier rider should take into account, however. 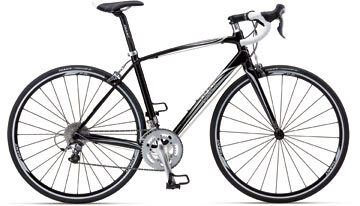 While there are advantages to an all-steel frame for any rider (mainly durability and comfort), the majority of entry-level and mid-range bicycles these days are made with aluminum frames. Steel, aluminum, or titanium would make an excellent choice of frame material for any heavy rider; all would hold up under normal non-aggressive riding conditions for recreation and fitness. The exception would be extremely lightweight aluminum or carbon fiber racing bike frames. In contrast to the actual bike frame, the wheels are the most common failure point we see with heavier riders, even among riders who are only slightly above average weight. So, this is the first upgrade that we recommend doing up front. The original wheels that come on a new bicycle typically have 32 spokes per wheel, but more is better. Enty-level bikes usually have single-wall rims, but better bikes have more durable double-wall rims. Some rims are still available in steel, but these are usually very cheap single-wall models. The best and strongest double-wall rims are made of aluminum. For even more durability, the rims should have metal eyelets on the spoke holes. Stainless steel spokes are pretty standard. For multi-gear bikes, there are two type of rear hubs--freewheel hubs and cassette hubs. The difference between the two is in the design of the axle and in the coasting mechanism. The important point, though, is that cassette hubs are much stronger and more durable. 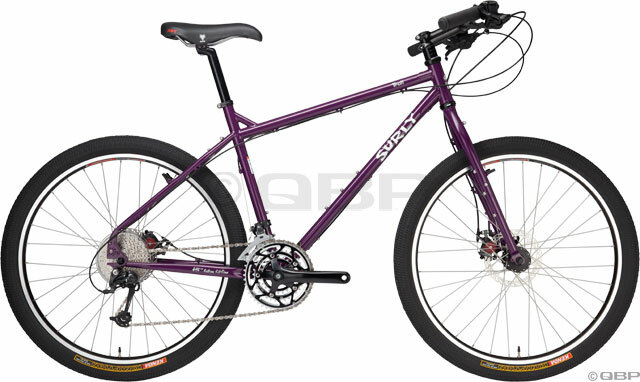 So, we recommend using 36-spoke wheels with double-wall aluminum rims and a cassette rear hub. If you upgrade the wheels immediately when you buy the bike, rather than waiting until your original wheels inevitably fail, we can give you credit for the original wheels, since we can re-sell them to somebody else. As mentioned before, the style of bike you choose is mainly driven by your riding comfort level and where you want to ride. Some overweight folks have issues with mobility, flexibility, or balance. If this is your situation, you might want to consider a flat-foot bicycle. These bikes resemble the old-fashioned beach cruisers, and they have a different frame design that allows the seat to be positioned low enough so that when you're sitting on the seat, you can put your feet flat on the ground. 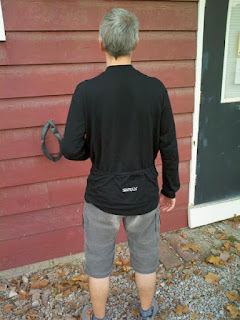 This provides a more stable-feeling and comfortable riding experience for many novice riders. 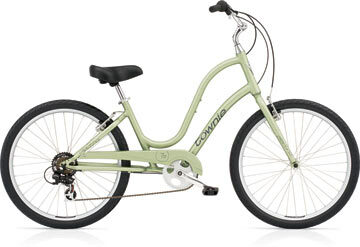 The bikes are available in single-speed, 3-speed, 7-speed, and 21-speed versions, with traditional frames and step-through ("women's") frames, so there's something to suit everyone's needs. 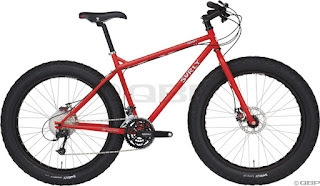 If you're a little more athletically inclined, and want to get a bike that will grow with you as get in shape, you might want to think about a standard mountain bike. 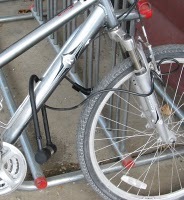 These bikes usually have front suspension; the more expensive models have full suspension front and rear. 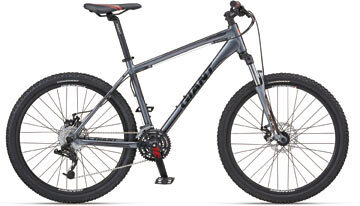 However, if you're just looking for a very sturdy, beefy bike to cruise around the bike paths on, a fully-rigid mountain bike might be more to your liking. 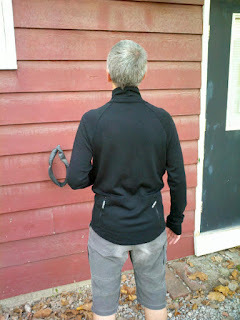 You'll be in a more aggressive riding position (i.e. 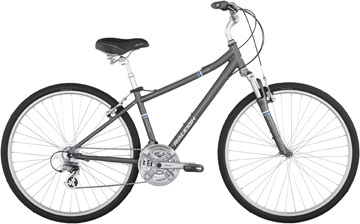 less upright, more leaned forward) on a bike like this, compared to a hybrid or flat-foot bicycle. You'll still have a nice wide tire for plenty of traction and support. A "road bike" is what we might have referred to years ago as a "10-speed" bike; they are distinguished by their skinny tires and drop handlebars. 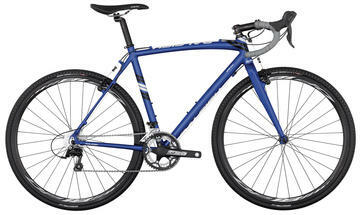 There is a special class of road bikes called cyclocross bikes; this would be a good option if you want this style of bike, because they still allow you to use a fairly wide tire. Most bicycles are available in several different frame sizes, but don't worry; we'll help you pick the size that's best for you. Whether it's been 2 years or twenty since you've been on a bike, there's one out there for you. By picking the style that works best for your needs, with some consideration of potential parts upgrades, you'll be well on your way to pedaling the pounds off! Hodala! 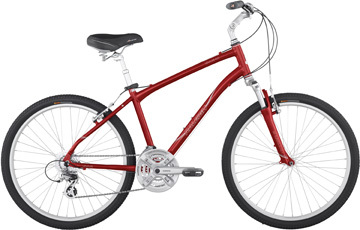 Bottoms up and cheers to Donna Winfield of Rocky River, who won the Deagan's Bike Night grand prize, a Raleigh Cadent i8 bicycle from Century Cycles. 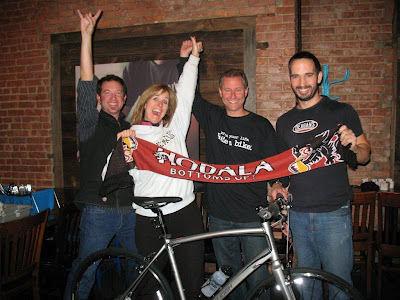 She is pictured celebrating with (from left to right) Sean Burkey from Raleigh Bicycles, Scott Cowan from Century Cycles, and Dan Stroup from Deagan's Kitchen + Bar. We had a rockin' time at the Deagan's Bike Night Finale party last Thursday, handing out lots of other prizes to Donna and all the other great folks who biked to at least one (but mostly more!) 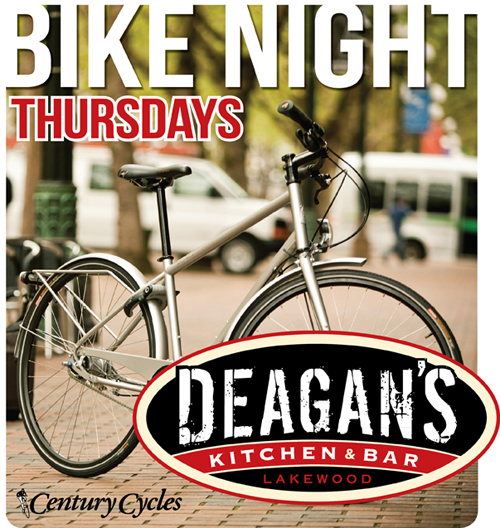 Deagan's Bike Nights this summer -- everything from socks and t-shirts to bike lights and gift cards, culminating in the grand prize bike giveaway. Donna and her husband, Terry, had biked to at least six Bike Nights since June, and they got entry forms for the grand prize drawing each time they did. 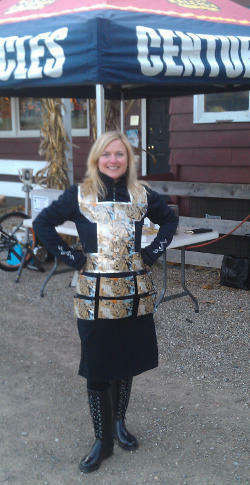 In fact, one of Donna's entries was chosen to win a Deagan's t-shirt right before another was chosen to win the bicycle. She had been out of town for work earlier in the day, but quickly rushed to Deagan's to make sure she didn't miss the drawing -- and it's a good thing!! Our thanks to Deagan's for another great season of biking, eating and drinking. We're already looking forward to the THIRD annual Deagan's Bike Night in 2013! 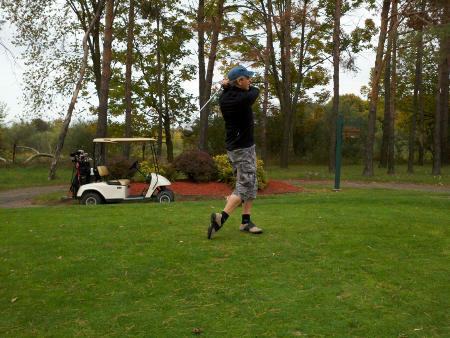 Here is our new friend Taylor Langley. 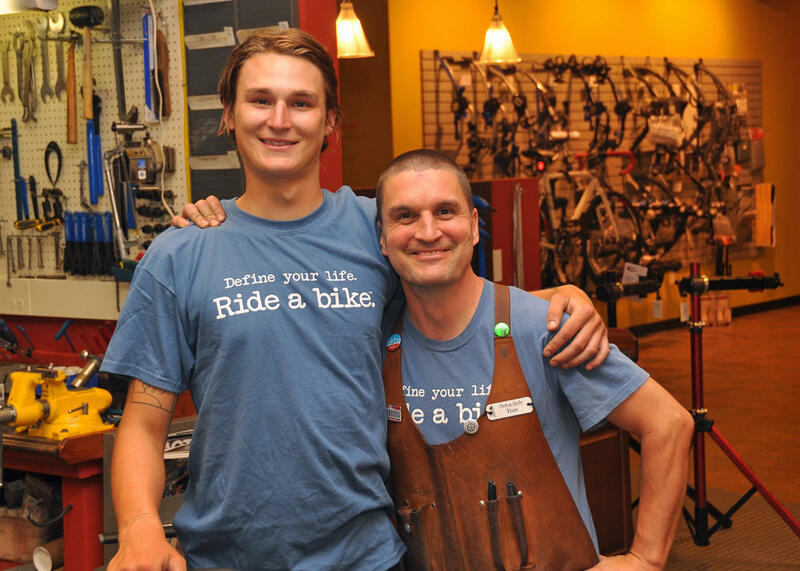 Taylor and his friend Jess were traveling cross-country on their bicycles from Washington to Maine when Taylor was hit by a car in Medina. Thankfully, Taylor's injuries were not serious. 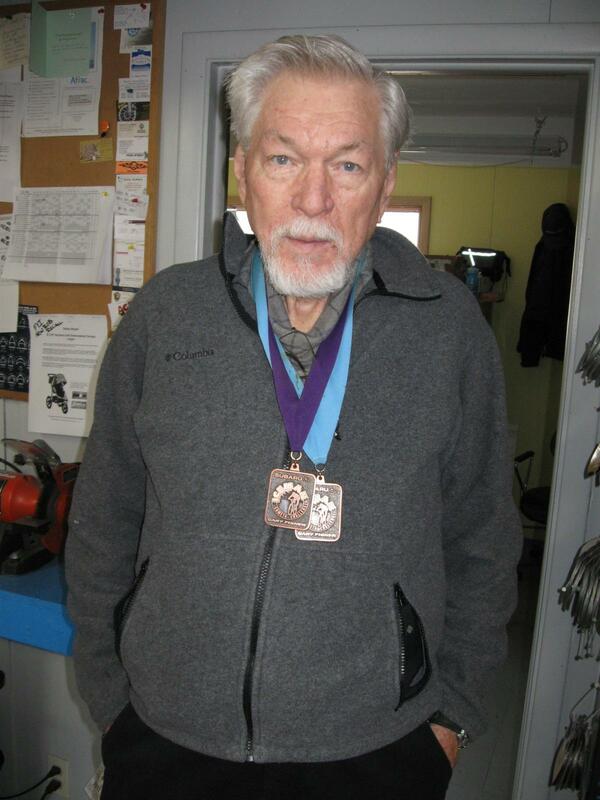 His bicycle, however, was a total loss and had to be replaced by the driver's insurance company. 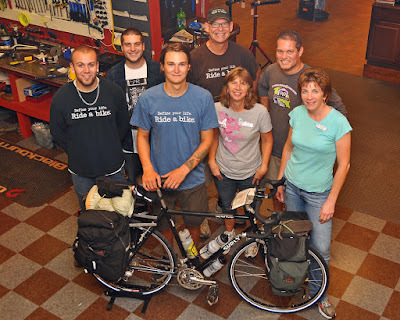 A search for their local bike shop brought them to Century Cycles. After a bit of down time while the insurance settlement was finalized, the process was complete and Taylor and Jess were back on the road. Here is Taylor (light blue) with Medina staff members and his brand new Surly Long Haul Trucker, ready to ride! 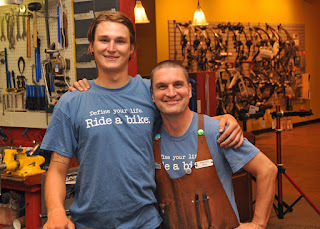 You can see more pictures of long-distance touring bicyclists who have visited our stores in our Bicycle Touring Photo Gallery. Come see if you won this Raleigh Cadent i8 bicycle at the Deagan's Bike Night finale party tonight, and help us celebrate another fun summer of bicycling to Deagan's every Thursday night! Besides the drawing for the bike, we'll be giving away lots of great prizes from us, Raleigh Bicycles and Deagan's! 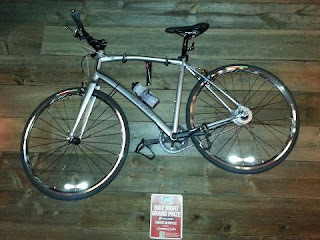 Bike Night starts at 5pm (bike to the party for one last chance to enter to win!). 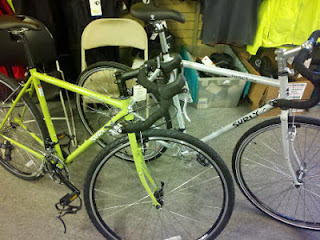 The prize giveaways will start at 7pm, culminating in the grand prize giveaway of a Raleigh bicycle from Century Cycles. 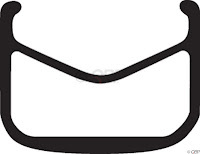 All winners MUST be present to redeem their prizes. 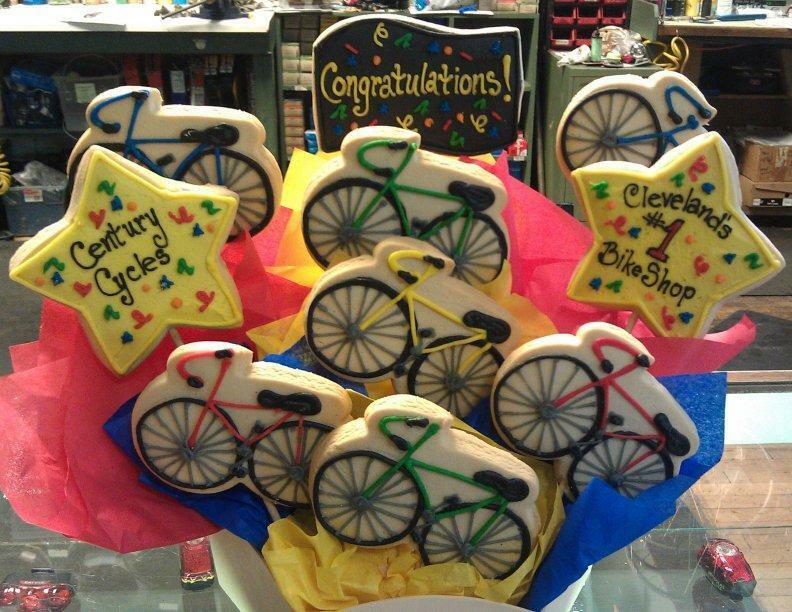 Everyone at Century Cycles was thrilled to see we once again -- for the third year in a row! 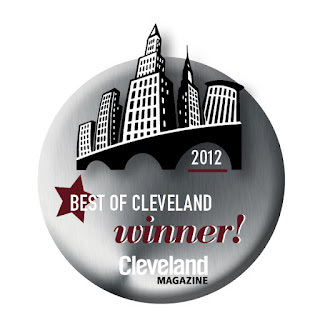 -- have won the reader's pick of Best Bike Shop in Cleveland Magazine's annual Best of Cleveland issue! 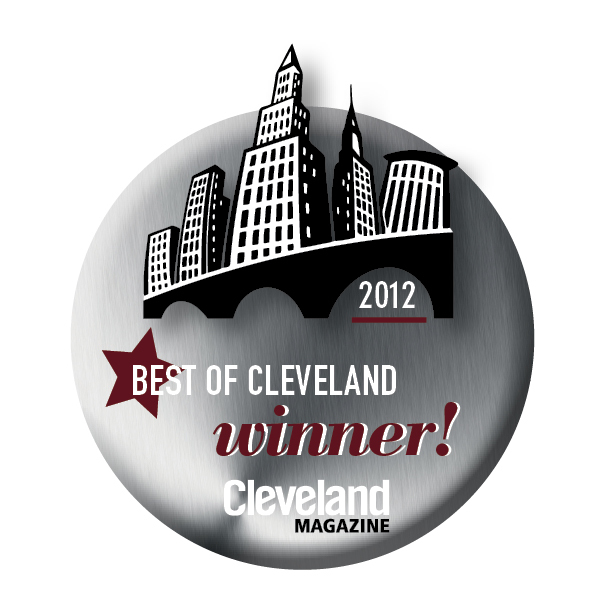 On Friday, we'll be celebrating with all the other "bests" at the Best of Cleveland Party at the Rock Hall. 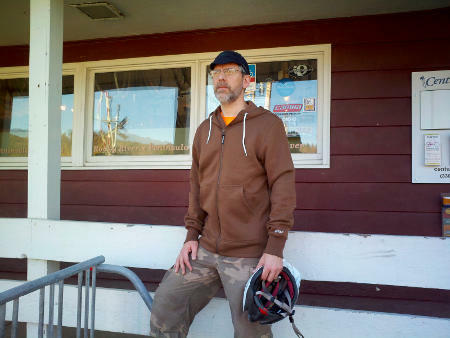 My long-sleeve wool jersey from Surly Bikes has been a staple of my cool-weather riding wardrobe for several years. The folks at Surly Intergalactic Headquarters have been busy updating their wool jerseys, and the new versions will be available to order some time in the next week or two. While at Interbike last month, we got to enjoy a fashion show, featuring volunteers from the industry modeling the latest clothing and gear. At the conclusion of the show, the vendors donated all of the goods for a silent auction, with all the proceeds going to Bikes Belong. I had pretty much been ignoring all of the wares on display, until Tracey came over to me in a flurry saying, "Kevin, Kevin, look, look, you have to see...!" 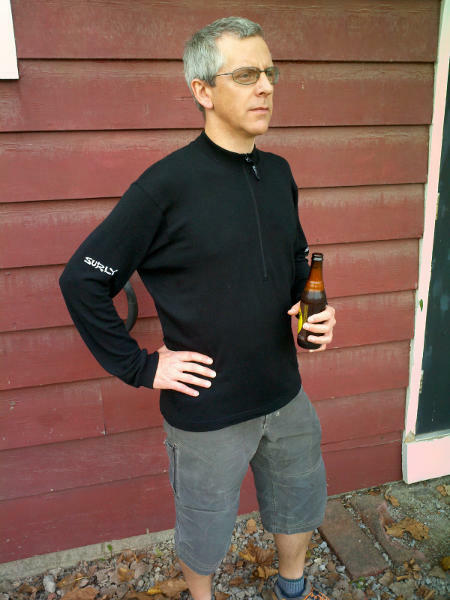 Well, to what did my wondering eyes appear, but one of these fancy new Surly Merino Wool Long-Sleeve Jerseys, sitting right there on the auction table (along with a pair of DeFeet Wooly Bully socks)! So, like that last thing I needed was another long-sleeve wool jersey in black, but the price was right, and it was for a good cause. Somebody had already place the minimum bid, so I jotted down my name and upped the ante by $10. Lo and behold, when all was said and done, I came out the winner! There was a women's model available, too, and wouldn't you know it, Tracey won that one! Also coming soon will be a Surly Hoodie in a wool/polyester blend in Black or Brown, $159.99. PLEASE NOTE: Due to a special event, all three of our stores will be CLOSED at 3:00pm this Saturday, October 6. For our rental bicycle service in Peninsula, the last time we'll let rental bikes go out will be 1:30pm. Also note that due to the Towpath Marathon, the Lock 29 Trailhead parking lot will be unavailable for parking beginning at 5:00pm on Saturday, October 6 until the conclusion of the race some time Sunday afternoon. The Overflow Parking Lot (up the street towards Terry Lumber) will be open both days. The Towpath Trail will be CLOSED the morning of Sunday, October 7 until the conclusion of the race. The closed area includes from the Botzum Trailhead to the south, up to the Canal Visitor Center to the north. To check when bicycle rentals will be available Sunday afternoon, please feel free to call us at 330-657-2209.